Okay guys so I am REALLY excited to share this post with you tonight because it's my childhood absolute FAVORITE movie coming back to life and you know what it is??? You're right if you guessed, ALADDIN!! This just made my night even better opening my inbox to see that Disney JUST released the teaser trailer for the May 2019, Aladdin!! I can't even express how excited and happy I am about this film coming back. It's my childhood and I know it's many of yours as well, so enjoy the teaser trailer below! You have to see this amazing teaser trailer for Aladdin. I'm really excited to be promoting it and can't wait to see even more as the months go by! A little about the film: Aladdin is the exciting tale of the charming street rat Aladdin, the courageous and self-determined Princess Jasmine and the Genie who may be the key to their future. 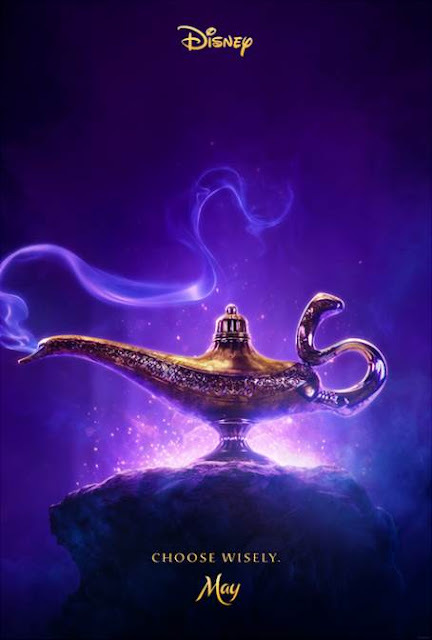 Directed by Guy Ritchie, who brings his singular flair for fast-paced, visceral action to the fictitious port city of Agrabah, the film is written by John August and Ritchie based on Disney’s Aladdin. The film is produced by Dan Lin and Jonathan Eirich with Marc Platt and Kevin De La Noy serving as executive producers. Alan Menken provides the score, which includes new recordings of the original songs written by Menken and lyricists Howard Ashman and Tim Rice and two new songs written by Menken and songwriters Benj Pasek and Justin Paul.The film, which was shot on practical stages in London and on location amidst the stunning desert vistas of Jordan, has a talented creative team helping to bring Agrabah to life.